Ideally, peanut planting has finished up, and crops should be emerged and growing well. If you were able to take advantage of the early warm weather and get peanuts planted in the April throuh early May time frame, you are moving into peak water requirements in about a month. You are currently (throughout the month of June) around requiring 1 to 1.75 inches per week. 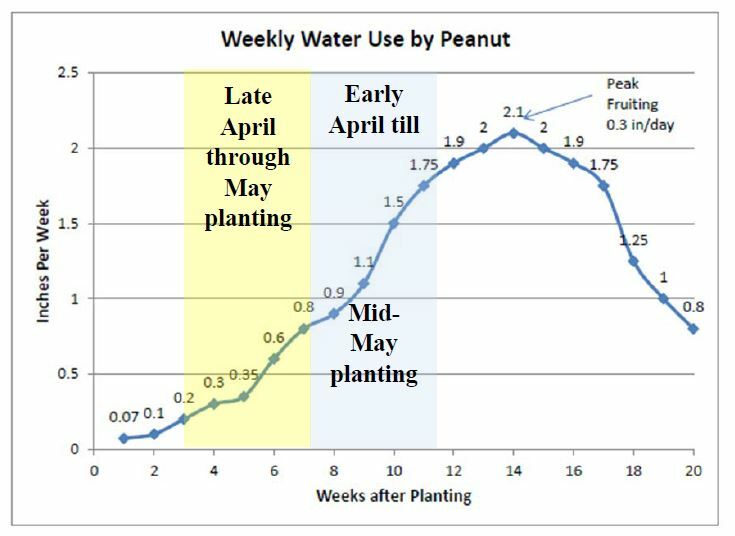 If you missed the first window and have just finished up planting your peanuts in the month of May, then you are still at a low water use stage. You are ranging somewhere between 0.2 and 0.8 inches required per week. Overwatering can hurt just as much as under-watering. Focus on keeping a record of local rainfall events and especially your irrigation applications. Just blindly irrigating a set number of times per week throughout the season will not aid you in properly meeting your requirements for the crop. Irrigating blindly will also not help in maximizing yield potential nor profit potential. Remember this requirement is IRRIGATION and RAINFALL. Irrigation may not even be required in the first few weeks. Good record keeping and a sound irrigation scheduling strategy can aid significantly in increasing profitability in multiple ways, including reductions in irrigation applications, correlating to reductions in energy requirements, and potentially increases in yield.